Reposted with permission from Elizabeth Van Deventer and Glenn Davis Stone: Originally published in FieldQuestions. When Green Mountain College, a sustainable farming school in Vermont, recently decided to slaughter their two aging oxen and serve the meat in the dining hall, the decision unleashed a flood of angry emails, Facebook posts, and protests from animal rights activists around the world. From the point of view of the college, consuming beef produced from animals raised humanely on their own farm, rather than from unknown origins elsewhere, fits squarely with their sustainable food production philosophy. However, to animal rights advocates, killing the oxen was simply wrong—regardless of the fact that one of the animals would have to be euthanized for leg injuries anyway. Activists threatened local slaughterhouses, leaving the college nowhere to take the cattle, so in the end, they decided to kill the injured ox without eating it, while sparing the life of the other. While animal rights groups might consider this a victory, I believe protesting a school that is trying to teach future farmers humane animal husbandry is ultimately counterproductive for animal welfare. Before saying any more, let me lay all my cards on the table. I’m a livestock farmer: I raise cattle and chickens for meat. But one reason I do this is that I believe farm animals are ultimately better served by a viable humane alternative to factory-farming than by vitriolic protests over their becoming food after a good life. I love animals and, unlike small-farm celebrity Joel Salatin, I agree with some of the activists’ criticisms of certain practices on small farms. However, I have come to realize that pasture-based livestock farming serves as part of the solution to the messy ethical dilemma of what to eat in an imperfect world. I have no desire to convince anyone to eat meat; I only wish to explain how I came to this conclusion. I actually think Americans eat too much meat, and if veganism takes business away from factory farms, I’m all for it. I’m just not convinced that ending all animal agriculture will ultimately best serve the planet or animals or us. While the animal rights movement has helped to raise people’s consciousness about the suffering of animals in the CAFO system, it also protests the pasture-based farms that are the only hope of humane animal agriculture in the face of global growth of factory farming. Having said that, I understand why people protested at Green Mountain. Killing an animal pulls emotional strings, as it should. Factory farms are based on people being desensitized to the real suffering of the animals. We easily forgot that these animals have sustained humans for millennia, and rather than feeling dominance over them, we should humbly acknowledge our dependence. I agree that we need to minimize our impact on the planet, yet I learned over many years that this is more complicated than just not eating meat. In college, I worked in a vegetarian restaurant where I heard for the first time that non-violence meant not eating meat. I loved the progressive atmosphere of the place, the wonderful mix of hippies, punk rockers and artists, and the feeling that we were doing something right, so I became a vegetarian. At times it did strike me odd to be preparing rice and beans, avocado melts, and smoothies while decked out in Goth-style black leather jackets and combat boots. I tried to conveniently forget that I was wearing dead cows while avoiding eating meat, or that the cheese on the avocado melts and the yogurt in the smoothies came from animals that would eventually be killed for hamburger and have their calves taken away and raised for veal. Perhaps no one knew that Kefir, eggs, and ice cream come from animals that will be eaten— laying hens become chicken soup and dairy cows are the basis of most fast-food hamburger. On some level, I knew that shunning meat but eating products from animals that would become someone else’s dinner, didn’t make a lot of sense. Yet I adopted the vegetarian identity because I loved animals and I hoped that somehow it would allow me to live without killing them. After college, I traveled and worked on different farms. During this time, I was continually confronted with new circumstances that challenged my vegetarianism and my secret hope that one day the whole world would become vegetarian. I traveled to Alaska where my brother worked as a bush pilot among native Yupik villages. As I flew in his plane over the tundra, it dawned on me why the Yupik ate mostly seal, moose, and caribou. They could never grow crops on this spongy land, under snow and in darkness most of the year. They could never be vegetarians unless they had all of their food shipped in from thousands of miles away. It was a profound realization for me how the land and climate shaped their diet. I learned the same lesson as a Peace Corps volunteer amongst Senufo farmers in the dusty Sahel of Mali, West Africa. Helping farmers grow soybeans, I slowly came to understand that these people could never be vegetarians, given that repeated droughts often made their crops fail, leaving children and old people vulnerable to starvation. I saw that their goats, chickens, and cows were like food safety nets on legs, a kind of back-up means of survival when their crops failed. Years later, living on farms in LeMorvan hills of Burgundy, France, I learned again how land and climate determine what foods people can produce most sustainably. Here, farmers raised cattle, goats, and sheep instead of wheat, corn, or soy because the hillsides were too steep and infertile to plow. Raising livestock was the only sustainable way to use the land in this part of Burgundy where the Charolais breed of cattle had evolved. Raising livestock or relying on hunting and gathering in marginal, arid lands is a typical historical pattern; a vegetarian diet is often not possible or sustainable. In fact, for many of the poor people I knew growing up in rural Virginia, a flock of chickens, a cow and a pig or two made the difference between going hungry or not. But I also began to see the hidden death toll behind vegetarian foods. I visited the Korup National Park in Cameroon, one of Africa’s oldest and most diverse rainforests. In order to get to the park boundaries, I had to walk for miles though rows of glossy tea bushes where old women with baskets tied to their heads were bent over picking tea leaves in the harsh sun. There rising above this sea of green hedgerows of tea stood a single African Zebrawood tree, its shallow buttress roots spiraling out into the rows of tea bushes. Horrified, I realized that this tree was the only remains of a rainforest; this whole tea plantation used to be like Korup. In that instant of shock, all my naïve images of tea began to taunt me—the peaceful drink of Buddhists and yoga instructors, the healthy alternative to coffee, the symbolic beverage of the vegetarian restaurant. How was I to know that the tea in my cup might have come from a burned-down rainforest? When I finally arrived at the park, I hiked for two days through a dense tangle of vegetation with the sounds of hooting monkeys and the calls of hundreds of different birds, with elephants and rhinos, butterflies and bats. Abruptly, this glorious symphony of life was transformed into an eerie silence and sameness as I stepped across a straight line into row upon row of perfectly spaced palm oil trees as far as I could see. The rainforest — home to so many thousands of plant and animal species — had been destroyed on one side to grow tea, and on the other to grow palm oil. In that same moment of horror, I felt a small sense of relief that at least I was not eating palm oil — at least, I thought I wasn’t. It was only later, while reading labels in the alternative food isle of a grocery store, that I began to realize that palm oil is in all sorts of foods. I went through the store frantically grabbing boxes, jars and bags checking for palm oil. I found it in soy milk, peanut butter, chocolate, chips, cookies, crackers, breads, ice creams, vegan cheese, shampoos, soaps and cleaners. I discovered that orangutans were facing extinction from losing rainforest habitat as a result of palm oil plantations, and that so-called “sustainable” palm oil often meant that virgin rainforest would still be destroyed. I was stunned. Certainly I’d heard of ranchers in South America clearing rainforest to raise beef cattle, yet why weren’t vegans and animal rights activists protesting palm oil, especially when the survival of one of our closest living primates is at stake? But palm oil and tea are not the only plant-based foods I found that destroy rainforest and animals. Working in a raw foods bar in downtown Seattle, I served fantastic smoothies that seemed to be the ultimate pure and clean food. Then while sipping a pineapple-banana smoothie, I had a flashback to walking from the rainforest into the deadened sameness of that palm oil plantation. Suddenly it dawned on me that pineapples, bananas, and coconuts might be grown in the same way as palm oil — in massive monocrops in the tropics where animals were eradicated and irreplaceable ecosystems were destroyed to make room for these domesticated fruits. Here I was in a vegan restaurant, eating what I assumed to be ethically pure food — only to discover that I was supporting a system of agriculture that had devastated some of the most vital ecosystems in the world. I found out that in the Philippines, Dole Corporation converts rainforest into fruit plantations by leasing the ancestral land of indigenous people from the government for a pittance.Removed from their forest, with no place to hunt and gather, they’re forced to work for the plantations, facing exposure to pesticides, chemical contamination in the water, and poverty-level wages. Despite these human rights abuses, nobody I knew had a diet that revolved around shunning banana bread or pineapple upside-down cake — only meat. I later realized that fruits and vegetables grown at home had their own death toll. One summer, while driving through the brown California hillsides, I passed through miles of avocado, orange, and lemon groves. In these arid plantations it occurred to me that much of my diet came from California. Many of these crops are irrigated with water from the Colorado River, and years of taking water from this river for agriculture and urban use led to the complete transformation of the Colorado River Delta in Mexico. This delta, one of the largest desert estuaries in the world had been drained, killing countless fish, river porpoises, and jaguars, and taking away the livelihood of the local Mexican people, all to produce vegetables that sustained me. I should have known: crops grown here in the U.S. also alter landscapes, replacing wild animals and their ecosystems with acres and acres of foods that I ate without question as a vegetarian. Certainly I knew that raising cattle in fragile desert ecosystems in the southwest was a bad idea, but I’d never thought that this might also be the case for fruits, vegetables, and nuts. I’d never heard of anyone protesting almonds or fruit salad — the only controversy was over eating meat. Later in North Carolina, I worked with a vegetarian farmer on his organic vegetable farm harvesting lettuce, basil and tomatoes for the local farmer’s markets. Over lunch of tofu and tomato sandwiches, we discussed what to do about the deer and rabbits that were eating thousands of dollars’ worth of lettuce? The farmer, a kind and caring man, had tried all sorts of ways to protect his crops, but finally resorted to shooting them. It was eye opening to think that animals were killed to raise vegetables. I also watched this farmer move massive piles of composted turkey litter into rows to plant spring crops, and realized that the waste of factory farms — the turkey feces, bones, feathers, and even carcasses — would be the basis of our vegetables. He didn’t have any farm animals to make manure, and cover crops were not enough to improve the clay soil’s friability and fertility, so turkey litter was his only option. I knew that many vegetarians came to his market stall to buy the beautiful red tomatoes, green peppers, and yellow squash, but with no meat wrapped in cellophane, there was nothing to show that the vegetables had been turkeys. These and other experiences revealed to me that attempting to escape death in eating was a futile goal the ultimate animal lover’s dilemma. I came to the sobering and humbling conclusion that I was dependent on other life, including animals, no matter what I ate. 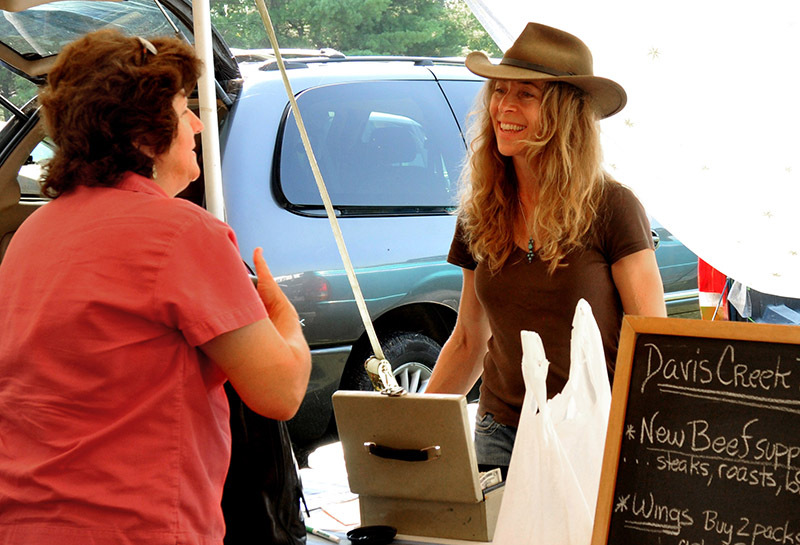 Eleven years ago, my husband and I bought a farm in the Blue Ridge Mountains of Virginia, intending to raise vegetables for farmer’s markets. As if my life wanted to make this point to me just one last time, we soon realized that plowing up the farm’s hilly pastures to grow crops would cause erosion,permanently destroying the fragile soils. Eventually,we concluded that the only way to use the land without harming it was as pasture to graze animals, and that livestock, if raised correctly, could improve soil fertility. After years of uncovering the hidden consequences of my vegetarian diet on the one hand, while learning the horrible truth behind factory farming on the other, I considered that maybe, rather than focusing solely on avoiding death, I needed to find a way to honor life. The farm gave me an opportunity to create an alternative to factory farming by honoring my animal’s lives rather than disregarding them, and by finally taking personal responsibility for my food. Since that first year, we have sought to give our animals not just humane treatment, but a joyful life. We name each cow to remind us that we are working with an individual and taking a life to sustain our own. Grandmother, mother, and daughter cows graze side by side, year after year — a basic pleasure denied even to pets, and we never lock our cows in cages all day like dogs in crates. We hug and scratch them and have taught them to follow us to new pastures with a simple call. When the males are slaughtered, they feed hundreds of people in our community that might have otherwise bought food from factory farms and before any animals are slaughtered, we pause to thank them for their gift of life. Once again, surrounded by nature, I see life fold into death and death fold back into life and I no longer fear it. I’m simply grateful to be a conscious part of it. Shortly after Nova turned twenty, I found her stuck in the mud, her old frail body unable to cross a shallow creek. For two days, my neighbor and I tried to get her out, propping her up with hay bales and pulling her with ropes tied to the truck. Finally, we had to admit she would not survive even if we got her out. Nova taught me that cows were never meant to get old — and an instantaneous death from a bullet is sometimes a whole lot more humane than this alternative. The end of life is never pleasant, but to think that the ox at Green Mountain that could have fed so many people was killed then buried, instead of eaten, makes little sense from a sustainability or animal welfare point of view. Would there be protesters if the university cafeteria chose to serve avocado melts using cheese from factory-farmed dairy cows, and pizza with a crust made from almonds irrigated by the Colorado River? If protesters really confronted the ethically messy consequences of eating, perhaps they would have looked into their own refrigerators and pantries to consider the death toll behind tea, coffee, processed foods, tropical fruits, grains, nuts, as well as many fruits and vegetables, before casting judgment on the school. Beautiful! So few people realize the havoc caused by our obsessions with food. So many of the well-meaning people touting fad "super foods" - tea, soy, quinoa - are completely unaware of the social and environmental damage being caused by the insatiable demand. Amen! I always wondered why it was okay for a pride of lions to attack and dismember a zebra, but somehow "unnatural" for humans to eat meat. Of course, anything in excess is not good, but the occasional ingestion of meat protein is not a crime. I certainly haven't eaten my parents, but when I see how old and frail they have become because they dedicated their lives to give me and my siblings a good start in life, I don't think it is outrageous to assume cows are willing to give their bodies up to those who love them and who they love back. 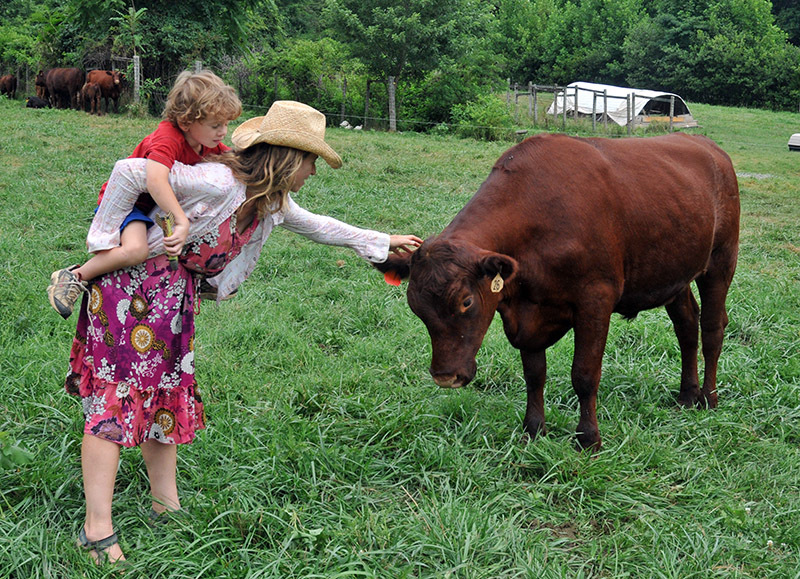 I am a member of a CSA that mainly provides vegetables, but also uses cows for making manure, milk and meat. I have personally milked "Betsy" and she seemed to be grateful for it. I have drunk their milk and eaten their butter, cheese and meat. I don't feel ashamed and I think Betsy and the other cows are happy too. That is the way it should be, and it is natural.